Project: 1-75 (SR 93), from North of River Road to North of SR 681 | Tierra, Inc. The project consisted of widening and partial realignment of the existing mainline 1-75 and associated ramps and cross streets. The roadway alignment traverses wetlands, low areas, and elevated roadway embankments. Tierra provided geotechnical input to the design team to assist in the design of exit and entrance ramps located at the intersections of River Road, Jacaranda Boulevard, Laurel Road and SR 681; overpasses located at North River Road, North Jackson Road, North Havana Road, and Jacaranda Boulevard; underpasses located at Border Road, Laurel Road and SR 681; and bridges crossing Curry Creek, Salt Creek, Cow Pen Slough, and Fox Creek. Tierra executed a subsurface exploration program consisting of borings, subsurface sampling and field-testing. A total of 11,145 feet of Standard Penetration Test (SPT) borings, 6,075 feet of hand auger borings, pavement coring and laboratory testing on selected samples was performed. 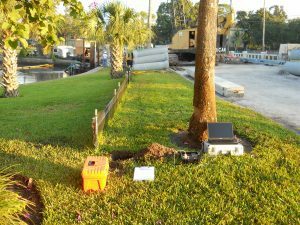 Geotechnical recommendations for roadway, stormwater retention areas, walls, culverts, signs/signals, and bridge structures were provided to guide the project design and construction.